Daktronics has continued a partnership with Ralph Engelstad Arena to install the largest centerhung LED video display in college hockey in Grand Forks, North Dakota. Installation is slated for the summer of 2019 and will be live for the following hockey season. “We are constantly searching for ways to enhance the fan experience,” says Jody Hodgson, general manager, Ralph Engelstad Arena. 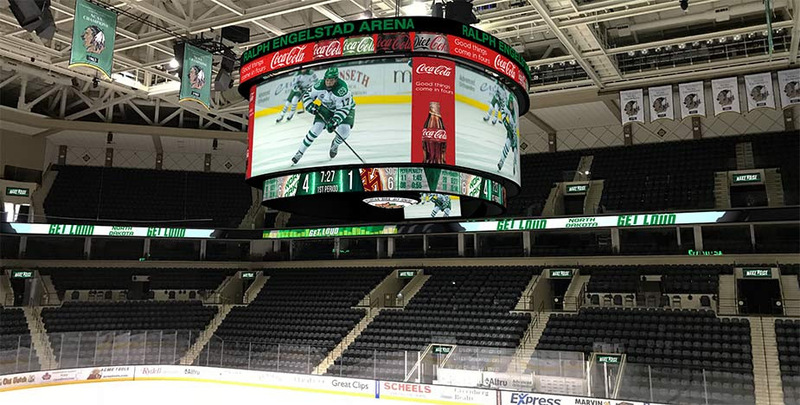 “Our new centerhung video board will be the biggest and best in all of college hockey. It will provide approximately four times the amount of video space compared with our current display. Consistent with Mr. Engelstad’s original wishes, every fan, in every seat, will have the same viewing experience because of the square dimensions and rounded corners selected for our new video board. The new centerhung display will measure approximately 15.5 ft. high by 135 ft. wide to bring a massive viewing experience totaling 2,100 sq. ft. for Fighting Hawks hockey fans and special event goers. It will feature 6mm line spacing to bring high-resolution imagery to every seat in the arena. This display is capable of variable content zoning allowing it to show one large image or be divided into multiple zones to show any combination of live video, instant replays, up-to-the-minute statistics, graphics, animations, and sponsorship messages. The centerhung configuration will also include an upper ring measuring 145.5 ft. in circumference and a lower ring measuring 129 ft. in circumference, both rings measuring 3 ft. high. Two underbelly displays will each measure 9.5 ft. high by 11.5 ft. wide to appeal to those seated closer to the ice. All centerhung displays will feature 6mm line spacing. A new ribbon display mounted to the seating fascia will be added to the venue along with 34 LED vomitory displays above entrances to the seating areas. The ribbon will measure 2.5 ft. high by 889 ft. wide while each vomitory display will measure 2 ft. high by 6 ft. wide. These displays will feature 10mm line spacing and allow for the opportunity to provide supplemental information to the main displays as well as highlight sponsors throughout events.